Tennis players and volunteers from Hinckley & Bosworth were well represented at the AEGON Leicestershire Lawn Tennis Association Awards evening. Among the winners was the Hinckley Town Tennis Club, together with Hinckley and Bosworth Sport and Health Alliance, who received the Disability Programme of the Year award. The programme has been running for 14 months and provides people with special needs the opportunity to learn, play and develop their tennis skills. 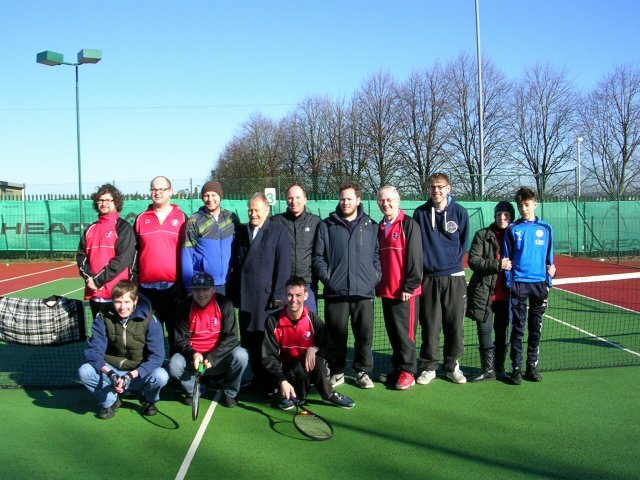 Building from the monthly Inclusive Sports Club running at Sport in Desford, the programme runs every week and sees over 15 participants take part in tennis drills and games improving their tennis skills, health and having fun. Meanwhile, Harry Matty from Desford Lawn Tennis Club won the Volunteer of the Year category. The 78-year-old helps out with everything – from sweeping courts and clearing ice, to encouraging young and old alike. If anyone needs a partner, he’ll pick up his racket and give them a good game. He comes into his own with the special groups – the inclusive tennis squad and the MacMillan physical activity group for cancer patients. His enthusiasm and good humour have encouraged hundreds to take up, or stay in, tennis and Desford Lawn Tennis Club would not be the same without Harry’s commitment and enthusiasm. In addition to Harry, Jacob Chilvers (Desford Lawn Tennis Club, LRS Elite Leader) and Connor Doughty (Hinckley Town Tennis Club, LRS Elite Leader) were finalists in the Young Volunteer category, while Matthew Chilvers (Desford Lawn Tennis Club, East Midlands Special Olympic Team) was a finalist in the Outstanding Achievement category. Cllr Peter Wallace, the Borough Council’s Sporting Champion, added: “I would like to congratulate all the finalists and winners. This really reflects the great depth of volunteers and programmes we have in the borough which encourages and inspires people to take part in sport.